Taylor has been in the business of precision measurement for almost 150 years. From measuring temperatures to measuring weight, Taylor Precision Products has become a name that equals accuracy. Taylor Instruments was founded on the motto, "Accuracy First". As they expanded from a factory producing small thermometers up to larger scale production of compasses, barometer and other scientific and industrial measuring devices during the 20th century, they continued their commitment to accuracy and innovation. The scale side of the company has its roots in the Hanson Scale Company, founded with a focus on light industrial scales. As they grew, they focused on designing to meet the needs of the customer. Through the decade, the original companies have been merged and acquired, and now they are branded under the name Taylor Precision Products. They are one of the leading measurement companies in the scientific, foodservice, industrial and residential sectors as they combine cutting edge technology and production with the highest quality of accurate measurement. For efficient and economical operation of any foodservice business, accurate portion control is essential. Taylor offers a large variety of portion control scales, ranging in size and weight capacities. High tech, digital portion scales with precise readouts, and mechanical scales with their durability and high quality construction. All with a focus on providing you with accurate measurement. Taylor manufactures a huge variety of high tech thermometers, including convenient probe thermometers and pocket thermometer models. Temperature is something that Taylor takes seriously. Every thermometer undergoes quality testing to make certain they provide you with the most accurate temperature readings for your particular application. Taylor's Digital Portion Control scales enable you to accurately prepare menu items and measure out specific portions. Accuracy means less waste and increased consistency from plate to plate. Every Taylor Digital Portion Scale has a stainless steel weighing platform, many of which are designed with a slightly-raised marine edge to help limit spills. Several models are water resistant or waterproof. The LCD display on the scale uses large, high-contrast, easy-to-read number and letters for quick but accurate reading. For the professional foodservice operation that uses food containers and measuring cups for weighing ingredients in the kitchen, Taylor has incorporated a Tare Function into each of their digital portion scales, allowing the scale to be "zeroed" with an empty container on the platform. Taylor Precision Products stands by its scales and gives a 1 year manufacturer's warranty against defects in materials and workmanship. Each Taylor Digital Portion Control Scale is engineered to provide many years of satisfactory service if handled and maintained carefully. All of Taylor's Mechanical Portion Control scales are of the spring compression type. These scales are calibrated to measure weight by accurately reporting the distance the internal spring moves while under the pressure of a load on the weighing platform. Every Taylor mechanical portion scale comes with a stainless steel weighing platform for durability. The scale's spring and its weighing mechanism are made from corrosion-resistant stainless steel for durability, long-term accuracy and strength. Many models come with an antimicrobial housing for better sanitary conditions. Shatterproof lens protects the scale's weight display dial. Large fonts and bold graphics on the dial improve readability for more accurate measurement. Many of Taylor's mechanical portion scales have a Tare Feature where you can rotate the dial pointer and adjust the indicator to point at zero after an empty measuring container has been placed on the platform. After weighing and the container is removed, the dial can be returned to the "Zero" position in preparation for the next measurement. Taylor Precision Products stands by its scales and gives a 1 year manufacturer's warranty against defects in materials and workmanship. Every Taylor Pocket Thermometer is made to provide you with an accurate temperature reading that you can rely on. When each degree of heat matters, these pocket thermometers are the tool to trust. Each pocket thermometer comes with its own protective sleeve with integrated pocket clip. 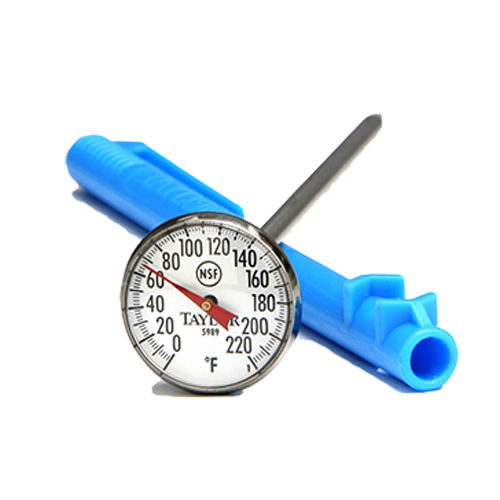 The thermometer stem is manufactured from stainless steel for durable, long lasting service. The digital pocket thermometers have easy-to-read LCD displays, most of which are waterproof. Most of Taylor's dial thermometers come with a lens over the dial that is shatterproof so you don't have to worry if you accidentally drop the thermometer in a hectic moment in the kitchen. Some of Taylor's dial models have glass magnifying lenses that help you quickly read the temperature. All of the Bi-Therm models come with a recalibration feature so the thermometer will always be accurate and they have incredible shock protection should they hit a hard surface. No matter where you need to measure the temperature, look for a Taylor Pocket Thermometer to give you the best reading. Unless you have a perfect, internal sense of timing, it is essential to have at least one timer you can trust in the kitchen. Taylor offers digital kitchen timers in a huge variety of styles and with a number of different features. From programmable meal plan, prep and serving schedules to multi-event timing (ideal for cooking two or more different menu items), Taylor has you covered. The cases of these timers are designed to withstand heavy usage and are constructed from stainless steel or strong, protective plastics. Most models are combination clocks and timers and nearly every Taylor digital timer comes with the option to stand on a flat surface or hang on a metal surface by magnet for convenient reading. 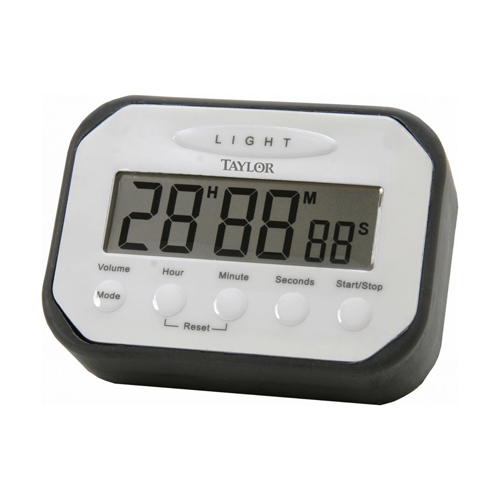 Taylor digital timers can be sleek, elegant and stylish or rugged and practical workhorses, but every model is durable, accurate, and reliable.